The Association for Behavior Analysis International (ABAI) Accreditation Board is the governance body responsible for the accreditation of training programs in behavior analysis at the bachelor’s, master’s, and doctoral levels. 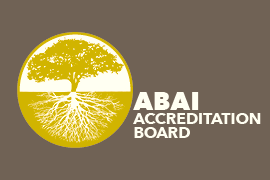 The Accreditation Board operates as a board of the Association for Behavior Analysis International (ABAI) and carries out its responsibilities in a manner consistent with the ABAI bylaws and articles of incorporation. The mission of the ABAI Accreditation Board is to establish and implement standards for the accreditation of educational programs in behavior analysis. The accreditation process is designed to encourage, support, and recognize exemplary training of behavior scientists and scientist-practitioners in the experimental and theoretical foundations of behavior analysis and in ethical and evidence-based practice, and to promote continuous improvement through voluntary accreditation. Sharon Brush received her BS in business (accounting) from the University of Nevada, Reno (UNR). She has worked in an administrative role at the Nevada System of Higher Education for the past 20 years. She started her career as an assistant to the regents before moving to UNR as an accounting assistant in the pharmacology and biochemistry departments. She then served as a grant analyst in the Office of Sponsored Projects before taking on her current role as fiscal officer of the College of Liberal Arts. In her current position she assists faculty in the behavior analysis program with grant and contract proposals, budgeting, billing (including insurance billing), customer service, and other administrative duties. In addition, she manages the college budget and assists its other 20 departments with their budgets and administrative needs. Dr. Claudia Dozier conducts applied research with her students at the Edna A. Hill Child Development Center on the University of Kansas campus. Her research interests are in applied behavior analysis and early childhood education and intervention for children with and without developmental disabilities, specifically in the assessment and treatment of inappropriate behavior (e.g., aggression, property destruction, self-injury, stereotypy, noncompliance), evaluation of procedures to increase appropriate behavior (e.g., language and communication skills, social interaction skills, self-help skills, academic skills), and determination of variables that may affect preference and reinforcer efficacy. She serves on the editorial boards of the Journal of Applied Behavior Analysis and Behavior Analysis in Practice. In addition, she is a guest associate editor for the Journal of Applied Behavior Analysis. She has been asked to provide guest editorial reviews for Education and Treatment of Children, Journal of Autism and Developmental Disabilities, Exceptional Children, and Teaching of Psychology. Dr. Dozier is a member of the Kansas Center for Autism Research and Training (KCART)/Life Span Institute Task Force. With her students, she provides training and clinical services through KCART. She is also the founder of the Functional Analysis Clinic for Children With Problem Behavior. Mitch Fryling received his BS and MA in psychology (behavior analysis) from Western Michigan University and his Ph.D. in psychology (behavior analysis) from the University of Nevada, Reno. His primary scholarly interests are in behavioral theory and philosophy, especially interbehaviorism and interbehavioral psychology, and the relationship between theory and application. In addition, Dr. Fryling conducts applied research with his graduate students, most often with children with autism spectrum disorders and related developmental disabilities. Dr. Fryling has published in a variety of journals, and serves on editorial boards, as an ad-hoc reviewer, and as an associate editor for several behavioral journals. Dr. Fryling is an assistant professor in the applied behavior analysis graduate program at California State University, Los Angeles. Dr. Michael Perone is a professor in the Department of Psychology at West Virginia University (WVU). He has made substantial contributions to behavior analysis through his research, service, administration, and teaching. He is well known for his programmatic research on conditioned reinforcement, avoidance, and transitions from rich to lean schedules of reinforcement, and more generally for the elegance and ingenuity of his experimental methodology. He has secured support from NICHHD, OSHA, and NSF for much of his research. His investigations with animals and extensions of basic mechanisms to humans serve as a prototype for research translation. Dr. Perone's accomplishments in administration, service to the discipline, and teaching are similarly noteworthy. He served for 12 years as chair of the WVU Department of Psychology, one of the foremost programs in behavior analysis. He has served as president of ABAI, SABA, SEAB, and SEABA. He has been appointed to key editorial positions for major journals in behavior analysis, represented behavior analysis on the Federation of Behavioral, Psychological, and Cognitive Sciences, and served on numerous committees. In each of those roles, his skill and humor have been instrumental in bringing a charge to effective completion. Dr. Perone has received numerous awards for his teaching and mentoring, which, along with the successes of his former students, are testaments to his effectiveness in these arenas as well. Jonathan Pinkston received his Ph.D. (behavior analysis) from the University of Florida, and completed post-doctoral positions at the University of Kansas (pharmacology) and the University of Texas Health Science Center at San Antonio (psychiatry). He is currently an assistant professor of behavior analysis at the University of North Texas (UNT). Dr. Pinkston’s research has contributed to our understanding of environmental, pharmacological, and developmental determinants of choice, environmental relationships modifying drug tolerance and sensitization, and the initiation and maintenance of alcohol consumption in laboratory models of alcoholism. Currently, his research focuses on understanding response effort and force as basic dimensions of behavior that serve directly and indirectly to modulate response cost, food and drug consumption, and choice. He has served on the editorial boards of The Behavior Analyst and the Journal of the Experimental Analysis of Behavior. Dr. Pinkston is also committed to science and critical thinking education and its importance for ongoing debates in our culture; his course Science, Skepticism, and Weird Behavior is among the most popular at UNT, and, to his great satisfaction, continues to grow in student demand. Professor Per Holth received his license to practice psychology in 1983, and his Ph.D. in 2000, with a dissertation on the generality of stimulus equivalence. His clinical work has been in services for people with autism and developmental disabilities, in psychiatric units, and in the military services. His research activities span basic research, on stimulus equivalence and joint attention, as well as applied work and management of large research projects. Per Holth has taught classes in behavior analysis and learning principles at the University of Oslo and Oslo and Akershus University College (OAUC) since 1982, and joined the faculty of OAUC and the Program for learning in complex systems, as an associate professor in 2004 and as full professor in 2006. He teaches classes in all behavior-analytic education programs at OAUC. He has written for peer-reviewed publications on basic research, applied work, and philosophy of science; served on several editorial boards; and he has a member of the editorial troika of the European Journal of Behavior Analysis for 15 years. He has been a program co-coordinator of the TPC area of ABAI, is currently a program co-coordinator for the development area, and he is on the board of directors of the B. F. Skinner Foundation. His current research interests have drifted in the direction of basic experimental work with animals and humans. After completing undergraduate work at Universidad Católica Andrés Bello in Venezuela, Maria E. Malott immediately began what can only be termed a distinguished career in large-scale performance management. After two years as performance systems analyst for the Central Office of Personnel in Venezuela, she entered the graduate program in applied behavior analysis at Western Michigan University, obtaining her Ph.D. in 1987. In 1989 she was hired as production manager at Ronningen Research & Development and within two years was vice-president of manufacturing. In 1993, she began a consulting career, and has consulted in the areas of advertising, restaurants, retail, manufacturing, hotels, banking, government, and other institutions. Her clients have included General Motors Corporation; Meijer, Inc.; Kellogg's; Pharmacia & Upjohn; the National Highway Traffic Safety Administration; and the Cancer Prevention Research Institute at the University of Arizona. In all of this work, Dr. Malott has combined systems analysis with the analysis of individual behavior within systems and, in the process, has taught dozens of corporate executives to appreciate the power of behavioral principles. Dr. Malott has been a visiting scholar at 32 universities in 15 countries and an affiliated faculty member at five universities. She has served on four editorial boards and is the author of a book on organizational change, published in Spanish and English, and co-author of second, third, and fourth editions of one of the most widely used and often translated textbooks in behavior analysis, Elementary Principles of Behavior. Dr. Malott was the recipient of the 2003 Award for International Dissemination of Behavior Analysis and the 2012 Award for Distinguished Service to Behavior Analysis from the Society for the Advancement of Behavior Analysis, as well as the 2004 Award for Outstanding Achievement in Organizational Behavior Management. In 1993, she agreed to serve as part-time executive director of ABAI and is now its CEO. Within a few short years, the association rose from near-bankruptcy to become a financially stable scientific and professional organization. Her organizational behavior management skills have been applied to every aspect of the operation of ABAI, which serves nearly 7,000 members and is the parent organization of more than 90 affiliated chapters. Jenna Mrljak earned her Ph.D. in psychology (behavior analysis) along with her MA and BS degrees from Western Michigan University, under the advising of Dr. Richard Malott. Throughout her graduate career she taught and supervised numerous undergraduate and graduate psychology courses. She trained and supervised over 65 graduate student instructors. She also has experience with OBM and helped develop extensive systems for performance management and continuous-quality improvements within those courses. She has several years of experience in early intervention for children with autism and has provided BCBA supervision for four years in early childhood special education classrooms. Additionally, her research included teaching critical prerequisite skills for children with autism and improving staff training systems in the classrooms. Her interests spread across many areas including early intervention, instructional design, technology, social justice, and behavioral systems at the cultural level. She is dedicated to researching and delivering high-quality educational programs for all learners. Dr. Mrljak is currently the Education Manager for the Association for Behavior Analysis International.